Just a gentle reminder to you ladies, Valentines day is just 7 days away. If you’re stuck for ideas on how to show your man/woman/pet/video game/favourite onesie your love, try this. 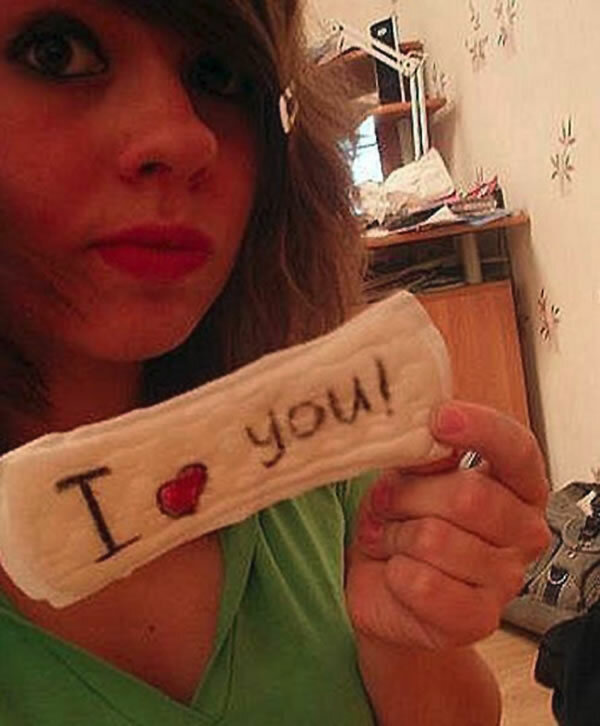 Nothing says I love you like a Sanitary Napkin! I’m off to write the internet a love note! But it’s not only an idea for the girls here, for the boys too. I have to search and to prepare…. Go make one for someone! Do it do it! Awww, Kev. Do you want one? You could display it on your wall forever. FOREVER I tell you! A new angle on the ‘your pad or mine’ approach! I know people are so much waiting for this day.. Wish you happy Valentines day in advance..hahaha..